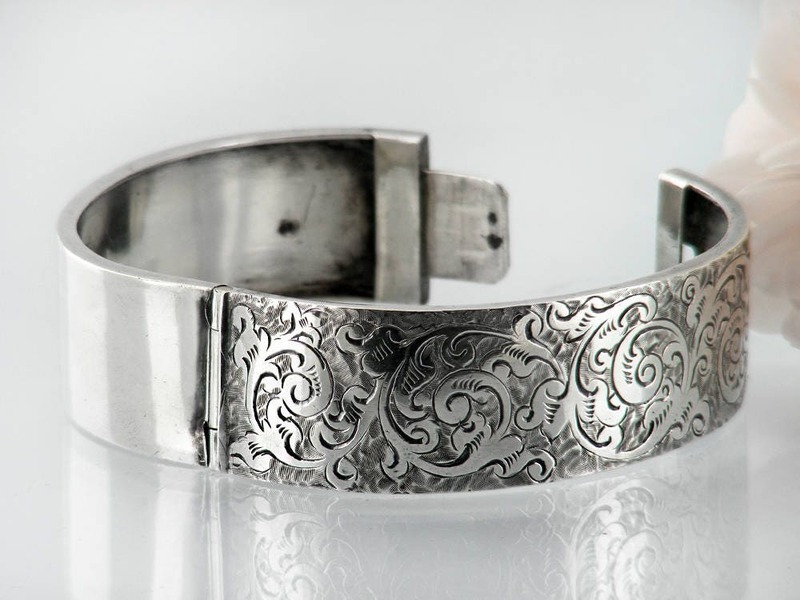 An exquisite sterling silver cuff bracelet from the Victorian era, this beauty was expertly made in 1882. 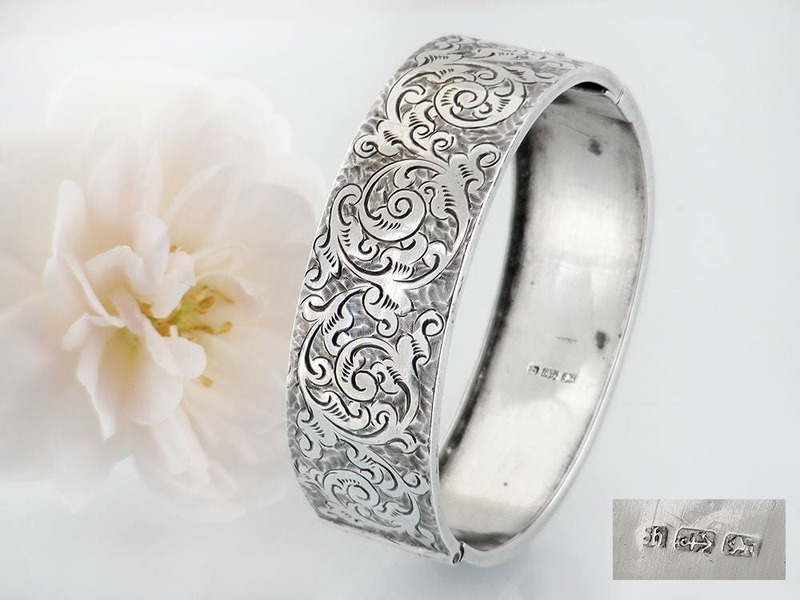 The cuff is hand chased with an intricate paisley-like pattern of acanthus leaf scrolls and flourishes, a finely detailed design. 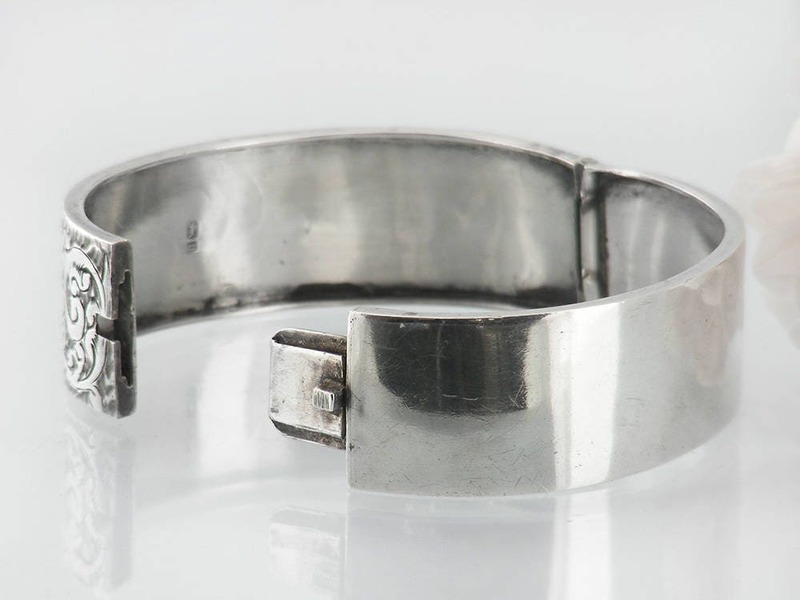 The bracelet has full hallmarks for sterling silver, the City of Birmingham, England and the year 1882. Both halves of the bracelet are stamped. 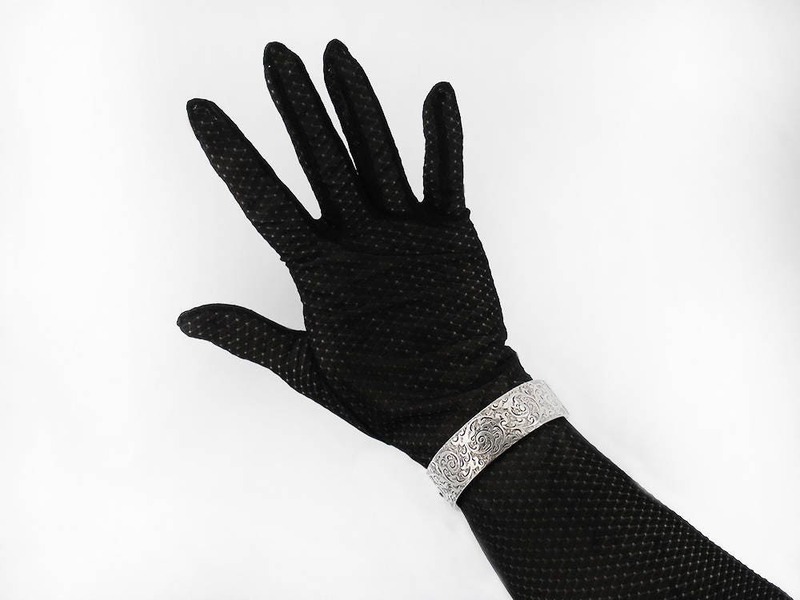 The back of the cuff is plain, smooth and lovely to handle. Closure is with a button that depresses an insert tongue which clicks firmly into position. 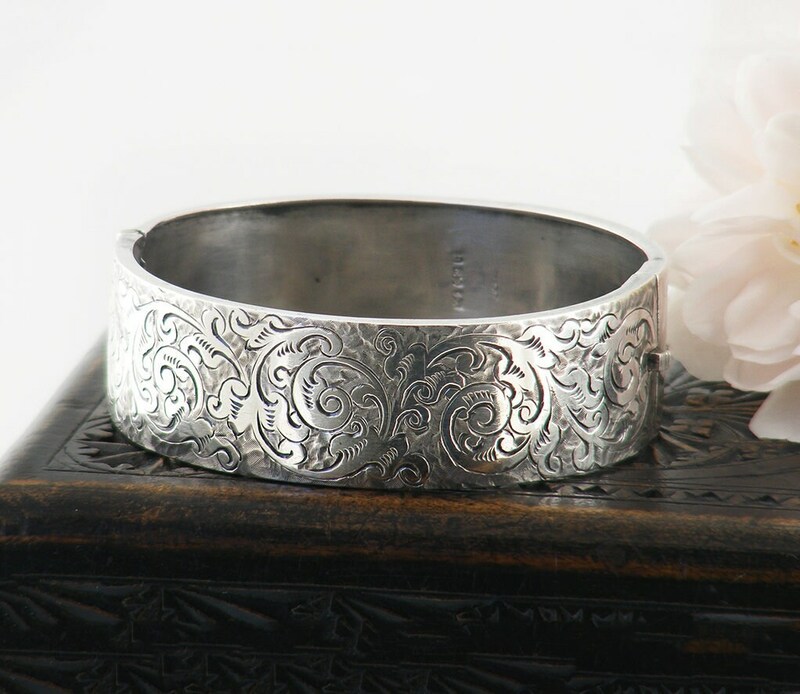 Will fit a small to average wrist size, the inner circumference is 6.5 inches or 17cm. Fits a 6 - 6.25 inch wrist perfectly. Inner diameters: 49 x 58mm (oval, elliptical in shape, designed to fit the wrist perfectly and not turn). Age: 1882 -135 years of age. Excellent. No issues to report other than a couple of dark spots on the inside and one tiny dimple to the back. The hinge is firm, coles with a nice snap and there is no gap at the closing edge. 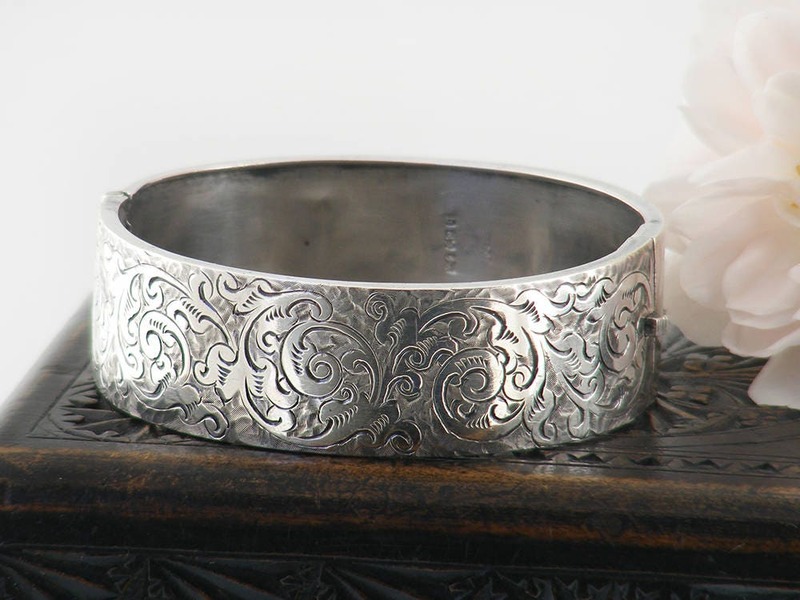 A very beautiful cuff bracelet. My favorite Victorian pattern - timelessly beautiful. - As needed to provide my services, such as when I use your information to fulfil your order, to settle disputes, or to provide customer support. PLEASE NOTE: We are unable to offer Layaways during November and December each year. During the rest of the year we offer a one month layaway on items over $100 with a 1/3rd initial deposit and two further payments over the next 4 weeks. Please convo for further information and queries. All orders are shipped via NZ Post Priority International Air Satchel with a target delivery time of 6-10 business days. ***Meeting these targets can be dependent on border controls/delays at destination and Holiday Season mail delays. 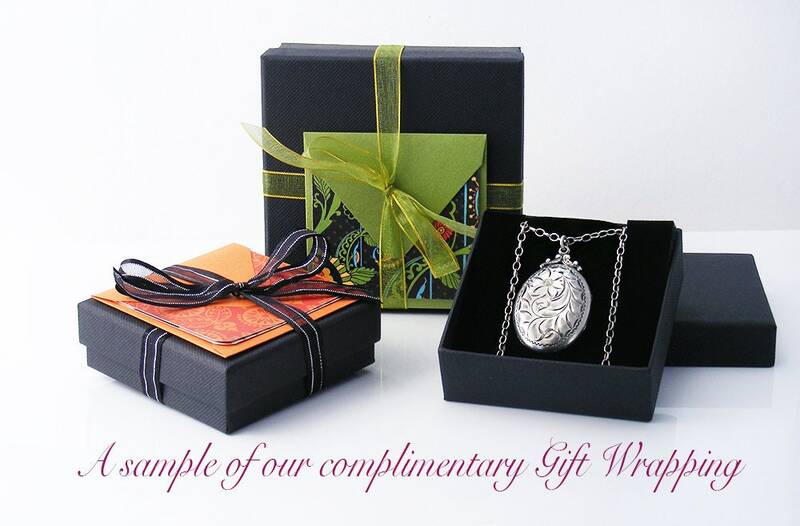 I gift wrap all purchases, you'll see a sample of Closetgothic wrapping on our About page and in every listing. Talk to us if you have any special requirement - I am most happy to hand write a note on request. I am located in UK / the EU. Do your prices include VAT? No. Being outside of the UK and the EU, we are not entitled to collect VAT. You will be responsible for any associated VAT and handling charges that are levied by your government or postal service. Is my Package Tracked and Insured? Tracking is provided for all orders. Your purchase is insured during transit. Shipping to Russia and Ukraine. I am unable to ship antique jewelry to The Russian Federation and Ukraine. No options are available to me - sincere apologies for this situation.